Its not been the best start to the year! No doubt you have seen the horrendous floods in York on the news; you may also have noticed the shop: Hooks & Tackle - under water! Totally washed out and is unlikely to re-open. We continue with our first class rod building and repair service under the new name Burns Rods of York. We look forward to hearing from you. 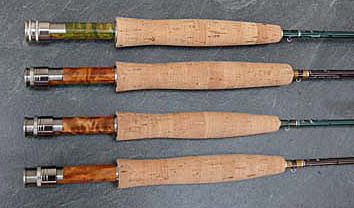 Hand built fly rods comparable in quality and finish to the very best of British and American fly rods. All rods are built on the finest Harrison blanks made in England, or CTS from New Zealandor and MHX blanks from the US with actions to suit all anglers and styles. The rods are finished in either rich chestnut brown, dark emerald green, deep blue, carbon grey or elegant maroon with matching whippings and top quality American style snake rings, hay fork end ring and supa-glide stripper rings. Standard reel seats have a satin chrome finish with either wood or carbon spacers; the carbon spacers matching the finish of the blank or more deluxe styles by Alps or Pacific Bay. Screw in rubber buttons or fighting butts can be fitted to 9½ft and 10 ft rods if preferred. The rods are built to order and can be personalised and built to your own specification and colour scheme with names and/or initials. Rods are supplied in a quality cloth rod bag and in our own rigid plastic rod tube with either silver finish or black end-caps. 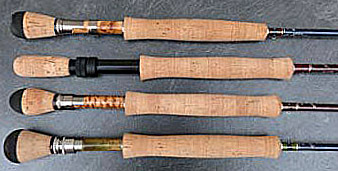 All types of fishing rod can be repaired and/or refurbished.